I remember my first road trip. I was four years old, and we were driving from South Carolina to Wyoming to spend the summer on a ranch. We were in a red Isuzu Trooper, and my little sister sat beside me in her carseat. Every time we stopped at a gas station, I got a new book to read, and by the time we arrived in Wyoming, I had the start of a small library. I grew up on the road, traveling throughout the Southern states, heading West occasionally, and even had a few trips to Canada and throughout Europe. I’ve always loved traveling by car. I don’t drive (perhaps that’s the reason?) so I get comfy and read, or listen to music and daydream. I wish, however, that I’d had a pair of these soft slippers for my feet while on the road. 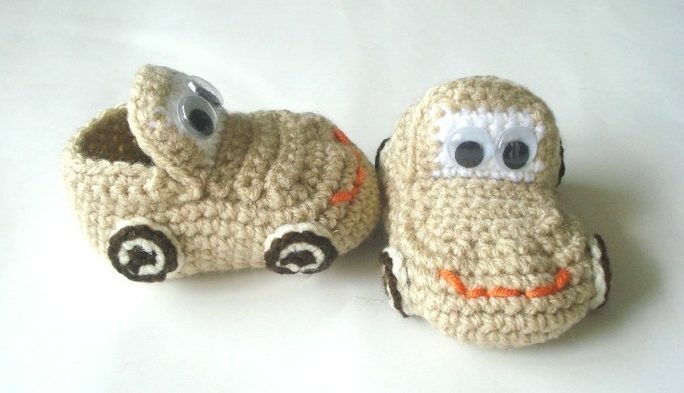 Car Booties are cute for travel as well as for those young vehicle enthusiasts who want to wear everything that proclaims them such. 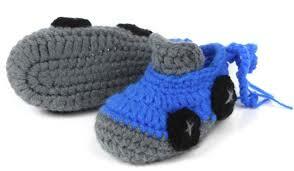 With soft yarn, some knitting needles, and a few hours, you can make these booties for the car lover in your life. I was the resident car lover in our family, taking cues from my mother’s side of the family, several of whom are mechanics. My brother, however, preferred tractors, and my sister preferred airplanes (if you have a kid or know a kid who likes other machines besides cars, there are patterns available for their preferences). 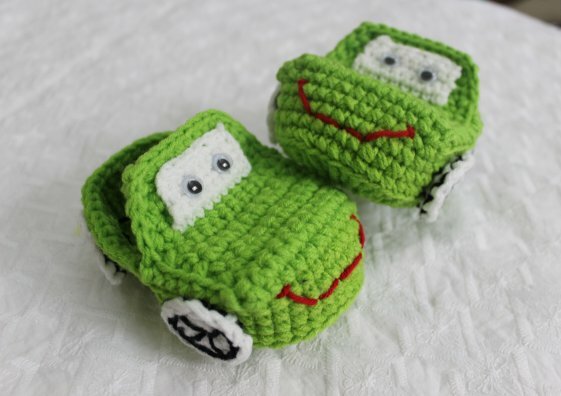 YouTuber Sevil Orgu has posted a video tutorial on how to make these car booties, but in the video they also show a chart for those of you who need to look at some instructions beforehand. If you’re new to charts, you may want to learn a bit more about how to read them before jumping into this project. I’d honestly recommend this pattern for more advanced knitters who have a background in reading charts and have spent a little time making up their own patterns. However, if you’re up for a challenge, I think advanced beginners could get a kick out of this project. Just be sure that you know the measurements of the feet you’re making the booties for, check the gauge as you go along, and have someone on hand if you have a question or slip a stitch. The best place to go in those cases is the local fiber shop, as there’s always someone around that is willing to lend their expertise for the sheer joy of sharing a hobby. 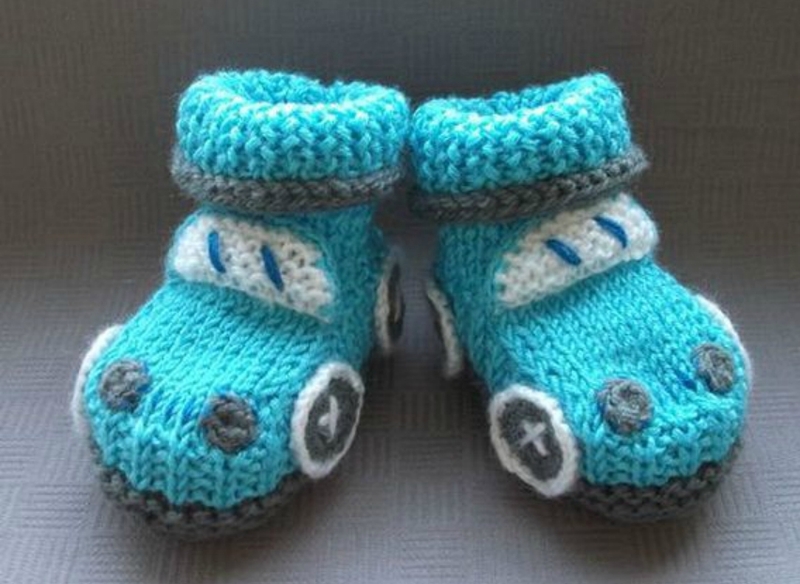 All that aside, these booties are too cute to resist, and even though I haven’t used my knitting needles lately, I might just have to brush up on my stitches and make a pair for the car-crazy babies in my life. I can imagine these in cute pastels, bold colors, or to match their favorite car. If this sounds like something right up your alley, you can find the video tutorial on YouTube, on the Sevil Orgu channel. You can follow them on Instagram, and browse through their other video tutorials, which include another car bootie pattern, converse sneaker booties, and a set including a sweater, hat, and shoes.